This majestic and substantial hotel overlooks the Atlantic Ocean with direct access to the seafront, and offers superb accommodation, excellent sports and recreational facilities, to suit all tastes. Four superb swimming pools and a spa and beauty centre will get you relaxed in next to no time and there's entertainment to enjoy during the day and evening. 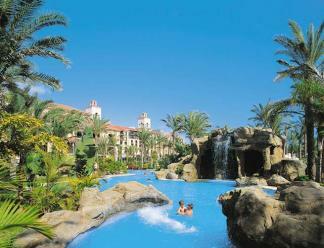 Maspalomas is two kilometres away and Playa del Ingles four kilometres away are both only a short bus or taxi ride away.